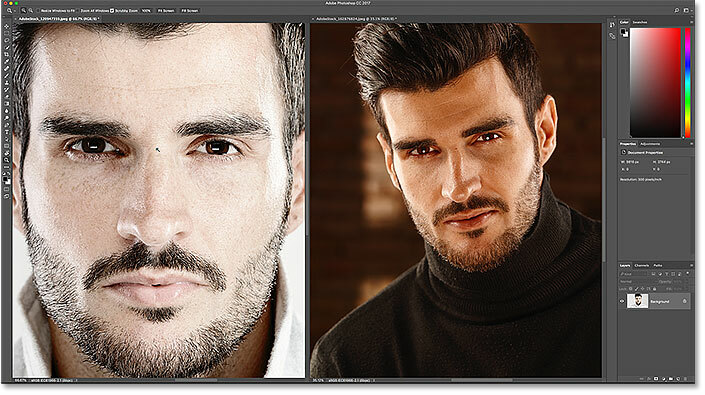 Learn how to zoom and pan multiple images at once in Photoshop! You'll learn pro-level tricks for zooming all open images at a time with the Zoom Tool and for scrolling all images with the Hand Tool, along with how to instantly jump every image to the same zoom level and location! In the previous tutorial in this series, we learned how to zoom, pan and navigate images in Photoshop. We learned that we zoom in and out using the Zoom Tool, and that we pan and scroll an image with the Hand Tool. In that lesson, we focused on navigating a single image. 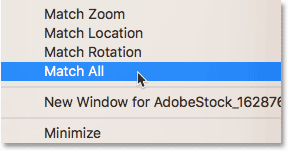 But just as Photoshop lets us open and view two or more images at once, it also lets us zoom and pan all of our open images at the same time. Let's see how it works! 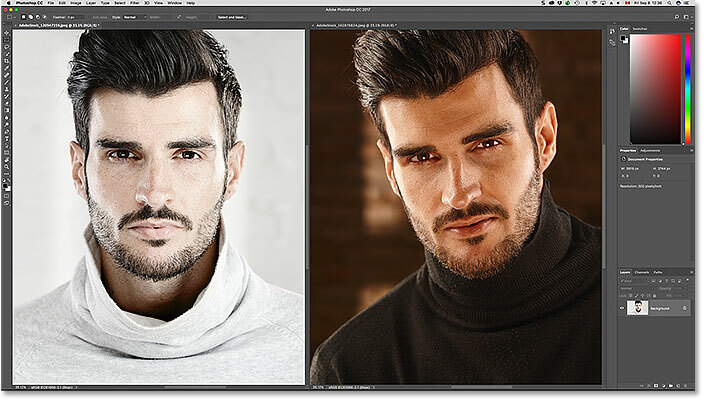 I'll cover everything you need to know to pan and zoom multiple images in Photoshop as we go through this lesson. But for the best results, you'll want to read through the previous Zooming and Panning Images tutorial before you continue. You'll also want to be familiar with how to view multiple images at once in Photoshop, and how to work with tabbed documents. I'll be using Photoshop CC but everything is fully compatible with Photoshop CS6. 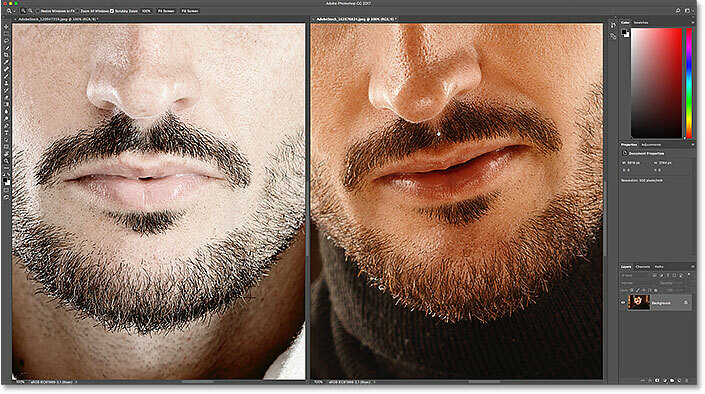 This is lesson 2 of 7 in Chapter 4 - Navigating Images in Photoshop. Let's get started! 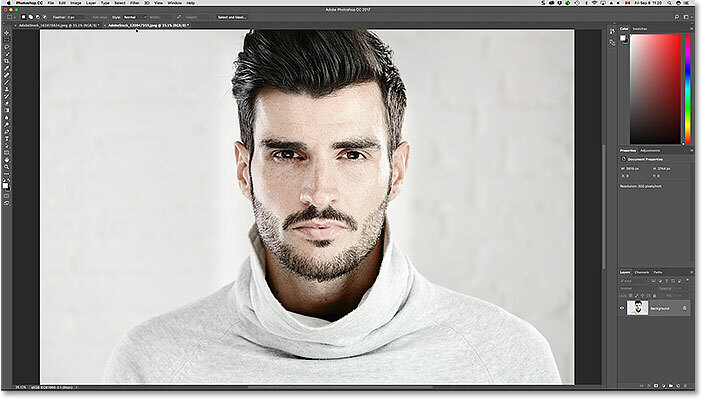 The first of two photos opened in Photoshop. Image credit: Adobe Stock. Clicking the document tabs to switch between open images. The second of the two photos. Image credit: Adobe Stock. Both documents are now visible using the 2-up Vertical layout. Choosing the Zoom Tool from the Toolbar. Zooming in on only one of the two images. To zoom all images, hold Shift and click to zoom in, or Shift+Alt (Win) / Shift+Option (Mac) to zoom out. As we learned in the previous tutorial, we can temporarily switch to the Zoom Tool any time we need it using a handy keyboard shortcut. To zoom in on a single image, press and hold Ctrl+spacebar (Win) / Command+spacebar (Mac) and click. 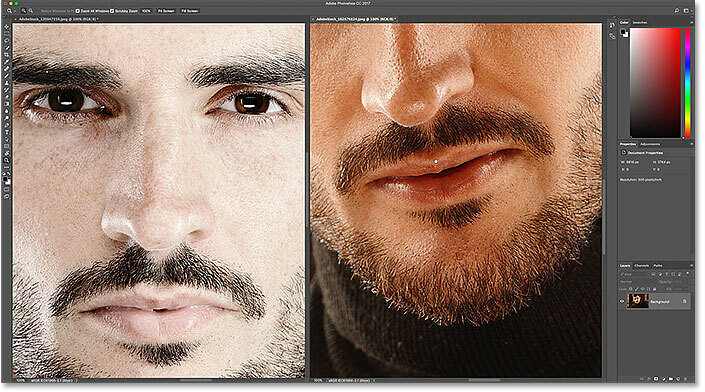 To zoom out from a single image, press and hold Ctrl+Alt+spacebar (Win) / Option+spacebar (Mac) and click. Release the keys when you're done to switch back to the previously-active tool. To zoom in on all open images at once from the keyboard, just add the Shift key to the original shortcut. To zoom in on all open images, click on any image while pressing and holding Shift+Ctrl+spacebar (Win) / Shift+Command+spacebar (Mac). To zoom out, click on any image while holding Shift+Ctrl+Alt+spacebar (Win) / Shift+Option+spacebar (Mac). 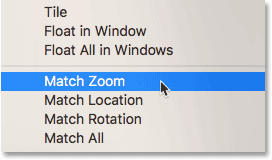 Use the "Zoom All Windows" to change the default behavior of the Zoom Tool. 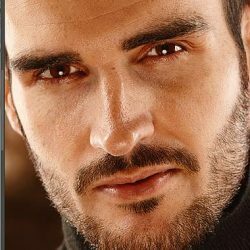 Use the "Match Zoom" command to instantly match the zoom level for all open images. Choosing the Hand Tool from the Toolbar. Panning only the image on the right. 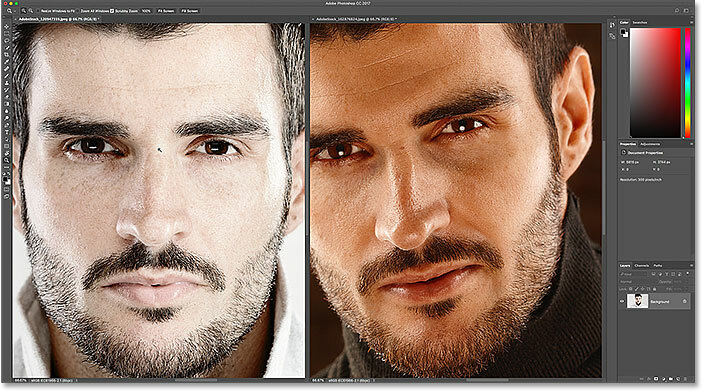 Holding Shift while clicking and dragging with the Hand Tool to move both images at the same time. To temporarily switch to the Hand Tool when any other tool is active in Photoshop, press and hold your spacebar. Then, to pan a single image, with the spacebar held down, simply click and drag the image to move it. Release your spacebar when you're done to switch back to the previously-active tool. To pan all open images at once from the keyboard, press and hold your Shift key and the spacebar. With the keys held down, click and drag any open image to move all of your images at the same time. Use "Scroll All Windows" to change the default behavior of the Hand Tool. Use "Match Location" to instantly match the locations of all open images. Use "Match All" to instantly match both the zoom level and the location of all open images. And there we have it! 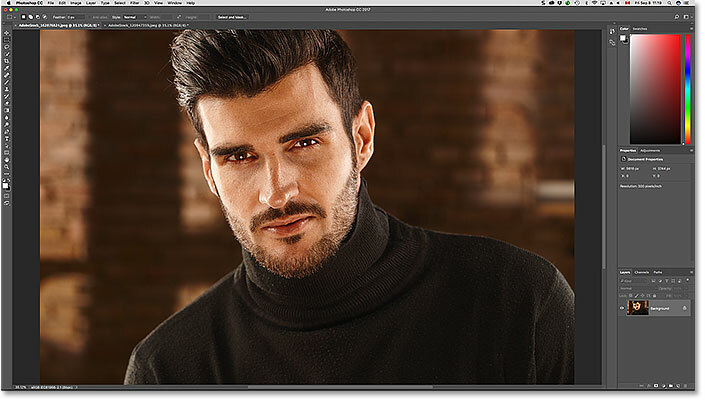 In the next lesson in this chapter, we'll learn all about Photoshop's Navigator panel and why it's perfect for navigating an image when you're zoomed in!